I’ll be the first to admit that I am something of a Facebook addict. Well, maybe “addict” is a bit of a stretch, but I certainly spend a decent amount of time Facebooking just about every day. I love that Facebook has given me a chance to reconnect with old friends and keep in touch with my loved ones who live so far away. And, it’s so much easier to keep people updated on what is going on in my live when I can share information and photos with a whole group instead of one individual at a time. 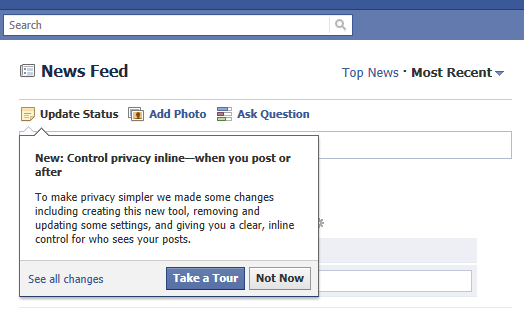 Yet, for all the things I love about Facebook, I have to admit, I get really irritated when they make changes. I’m all for improvement, but I think most Facebookers would agree that not every Facebook update was necessary or an improvement. I mean, if it ain’t broke, why fix it? Right? Did we really need a new format to look at photos? And how many times are you going to change the format of the page where I view my news feed? Worse than that, why does Facebook feel the need to accompany every change with annoying pop up boxes that offer to take you on a tour of the “new and improved” format? And why can’t I just decline the tour once, instead of having to click the “Not Right Now” button every time I visit the page? Seriously? Is Facebook really so advanced that I need a tour to understand all of the intricate features? I mean, I’m no computer genius, but so far I have been able to navigate Facebook pretty well with no formal training. No tours for me, thanks. I think I’ll save my brainpower in case I ever decide to buckle down and get my doctorate degree. 1. Why are you friends with this person in the first place? 2. Why are you even sharing this information online at all? If you don’t want someone to know something, then don’t post it. Period. See how simple that was? No tour required. Tonight’s 365 Project is dedicated to Facebook. Thanks for helping me keep in touch with everyone. Now please, leave well enough alone.